BACKGROUND AND PURPOSE: The role of blood-flow biomechanics on the size, morphology, and growth of cerebral aneurysms is poorly known. The purpose of this study was to evaluate intra-aneurysmal hemodynamics before and after aneurysm growth. MATERIALS AND METHODS: A flow-simulation study was performed in a middle cerebral artery (MCA) aneurysm with a bleb that grew after 1-year follow-up. Geometrically realistic in vitro models before and after aneurysm growth were constructed on the basis of CT angiograms. Blood-flow velocity, vorticity, and wall shear stress were obtained by using particle imaging velocimetry and laser Doppler velocimetry. RESULTS: No significant quantitative differences were noted among the overall flow structures before and after aneurysm growth, with the exception of less vorticity in the bleb after aneurysm growth. A circulating flow pattern was seen within the aneurysm domes. A blood-flow separation was observed at the margins of the bleb. No impingement of inward flow into the enlarging bleb was noted. Before the aneurysm growth, the wall shear stress was high at the aneurysm neck and also at the margin of the bleb. The value of wall shear stress decreased in the deeper part of the bleb. This value decreased even more after the aneurysm growth. CONCLUSIONS: Intra-aneurysmal hemodynamic structures before and after the growth of an MCA aneurysm were compared. Further investigation with a similar approach is mandatory to obtain a firm conclusion. Postmortem studies estimate that as much as 5% of the population may harbor saccular cerebral aneurysms.1 Because of recent advancements in the minimally invasive neuroimaging technology, these aneurysms are more frequently detected before their rupture. On the other hand, the mechanisms of aneurysm growth and rupture are poorly understood. Consequently, intra-aneurysmal hemodynamics has received increasing attention over the past few years. Numerous reports have been published paying special attention to blood-flow structures in patients’ cerebral aneurysms.2–6 We believe that no publication has compared blood-flow changes in a saccular aneurysm before and after the growth, though such a study would be helpful to understand a possible contribution of hemodynamics to the process of aneurysm degeneration. The purpose of this study was to document intra-aneurysmal hemodynamics before and after an aneurysm growth. Geometrically realistic in vitro aneurysm models were created by using a longitudinal CT angiogram data base of patients’ cerebral aneurysms. Detailed flow velocity and wall shear stress measurements were performed in multiple points within the aneurysm dome and bleb. An incidental small wide-necked left middle cerebral artery (MCA) aneurysm found in a 43-year-old female patient was selected from a longitudinal 3D CT angiography data base. The patient had no history of systemic or vascular diseases known to be associated with brain aneurysm formation. The MCA aneurysm had a very small focal dilation (bleb) on its dome (Fig 1A), which enlarged after 1 year (Fig 1B). The patient underwent surgical clipping of the aneurysm on the basis of this anatomic information. 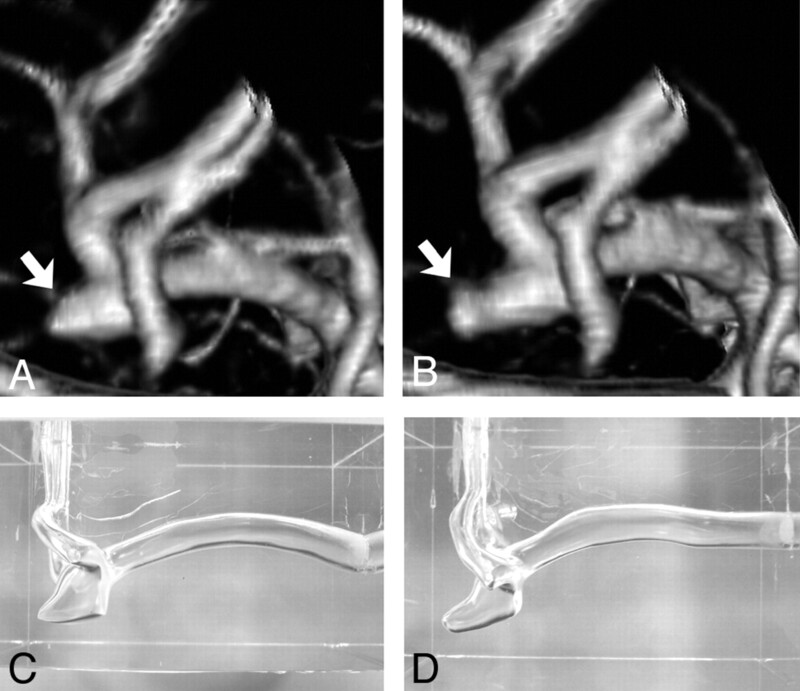 3D CT angiograms of the MCA aneurysm before and after the aneurysm growth were used to compare hemodynamic characteristics. A, Volume-rendering 3D image of left MCA aneurysm, posteroanterior view, before growth. Arrow indicates outpouching (bleb) on the aneurysm dome. B, Volume-rendering 3D image of the same left MCA aneurysm, posteroanterior view, after growth of the aneurysm bleb (arrow). C, A silicon aneurysm model of the left MCA aneurysm before growth. D, A silicon aneurysm model of the left MCA aneurysm after growth. The CT angiogram dataset was obtained by using a helical CT scanner (GE CTi, GE Healthcare, Milwaukee, Wis). Section collimation was 1.0 mm with a 0.5-mm reconstruction interval. FOV was 180 mm, with a matrix size of 512 × 512; spatial resolution was 0.35 mm × 0.35 mm. The CT angiogram of the aneurysm included pre- and postbifurcation segments of the MCA and the aneurysm itself. The dome of the MCA aneurysm measured approximately 4 mm in its longest diameter before growth and 6 mm after growth. The prebifurcation segment of the MCA measured 3.5 mm in its largest diameter. The construction method of a geometrically realistic in vitro aneurysm model based on CT angiography has been published.7 In brief, on the basis of the 3D surface data constructed from the source images of CT angiography, male casts of the MCA aneurysms were created with the use of rapid prototyping technology. The size of the male casts was scaled up by 3.0 times compared with the original size so that detailed 3D flow structure and wall shear stress distribution in such a small aneurysm could be evaluated. Pre- and postgrowth in vitro silicone aneurysm models were then constructed by using the male casts as a mold (Fig 1C, -D). We applied the concept of dimensional analysis and the law of similarity to create physiologic flow conditions in the scaled-up aneurysm model. According to these concepts, not all flow parameters such as kinematic viscosity, flow velocity, and duration of 1 pulse wave have to be matched to get an accurate flow-velocity simulation, as long as dimensionless similarity parameters and the waveform shape in the parent artery are matched.7–9 In this study, dimensionless similarity parameters such as the in vitro Reynolds number and the Womersley pulsatility index were arranged to match those values depicted in vivo. The maximum Reynolds number and Womersley pulsatility index in the parent arteries (prebifurcation segment of the MCA) of both in vitro models were 800 and 5.0, respectively. The working fluid used in the model was an aqueous solution of glycerol (58.4% by weight) with the refraction index of 1.409. These values were matched to those in the silicon test section so that the optical distortion at the interface between the working fluid and the silicon could be avoided and flow-velocity measurements with laser Doppler velocimetry (LDV) and particle imaging velocimetry (PIV) could be used. The kinematic viscosity was 4.2 × 10−6 cm2/s in an operating temperature of 25°C. Quantitative flow-velocity structure before and after the growth of the MCA aneurysm was obtained using PIV System (Kanomax, Osaka, Japan). Silica particles with the size of 10 μm were added to the working fluid during the PIV measurements. The reflective silica particles were illuminated as they passed through a sheet of laser light, and sequential images of illuminated reflective particles in the sheet of laser light were acquired by the PIV. From those sequential images, a computer software program calculated direction and velocity of the particles. Flow-data acquisition was performed at 15 phases during a cardiac cycle in the pregrowth aneurysm model and at 18 phases in the postgrowth model. Flow-velocity vectors were obtained on 4 planes in the MCA aneurysm (3 planes perpendicular to the natural axis of the aneurysm and sagittal planes) and also on 1 plane in the parent artery (midpoint of the horizontal segment of the MCA). The rotational flow expressed by vorticity was also calculated by using the flow-velocity vectors acquired by PIV. The vorticity was given in the following equation: ω = rotυ, where ω is vorticity and rotυ is velocity vector. The value of the fluid-induced wall shear was calculated from the flow-velocity results obtained by IFA 650 (TSI, Shoreview, Minn) with the measurement dimensions of 180 × 34.2μm. The LDV probe was mounted on a bidirectional traversing table allowing the measurement volume to be positioned within 5μm resolution. Titanium dioxide particles (0.63 μm) were added in the working fluid before the data acquisition with LDV. The flow-velocity result at each point was produced after the final average of 50 consecutive measurements. Flow-velocity vectors in the midsagittal plane are shown in Fig 2. The aneurysm inflow zone and flow structures in the aneurysm bleb were clearly depicted in this plane. A and B, Intra-aneurysmal flow before growth. 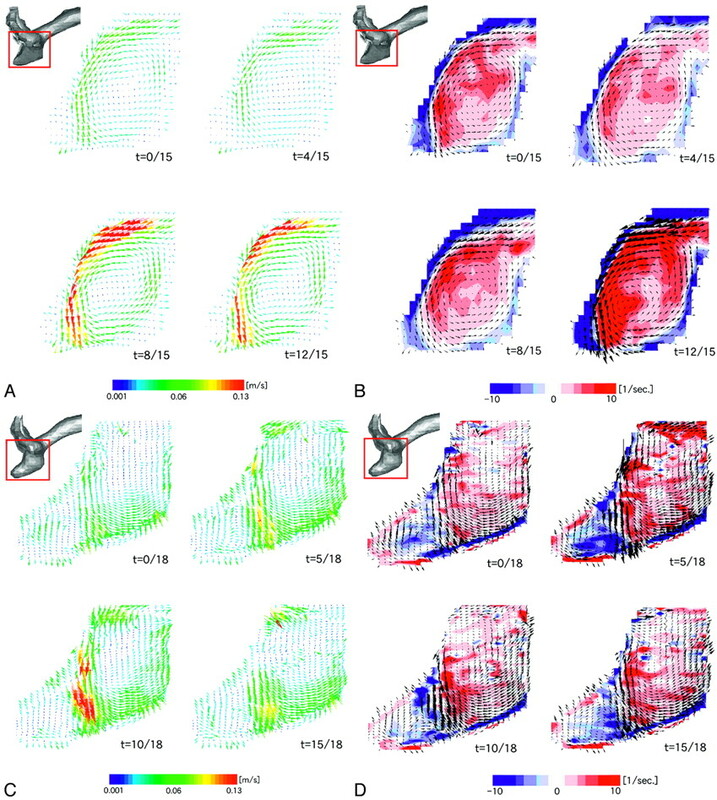 Alteration of flow-velocity structure (A) and vorticity mapping (B) during 1 cardiac cycle are presented on the midsagittal plane. C and D, Intra-aneurysmal flow after growth. Alteration of flow velocity structure (C) and vorticity mapping (D) during 1 cardiac cycle are presented on the corresponding midsagittal plane. Red and blue colors on vorticity mapping indicate counterclockwise and clockwise vortices, respectively; t indicates time. In the pregrowth aneurysm model (Fig 2A), the fluid flow entered into the aneurysm in the superior part of the neck and moved along the superior side of the aneurysm wall. The fluid flow then separated from the aneurysm wall at the margin of the aneurysm bleb, changing its direction inferiorly, and impinged on the inferior side of the aneurysm wall. There was no impinging flow onto the aneurysm bleb (enlarging area). The outward flow was noted along the inferior side of the aneurysm wall. The flow velocity of the outward flow was slower than that of the inward flow. Figure 2B shows vorticity mapping at the same midsagittal plane. The red and blue colors indicate counterclockwise and clockwise vortices, respectively. There was a counterclockwise circulating flow pattern within the aneurysm, a small clockwise circulating flow within the bleb, and the strength of the vorticity changed during a cardiac cycle. The velocity of the circulating flow pattern within the aneurysm dome was approximately 14% of the maximum flow velocity in the parent artery. In the postgrowth aneurysm model, no substantial difference was noted in the overall flow velocity structure compared with the pregrowth model (Fig 2C). As noted in the pregrowth model, a counterclockwise circulating flow pattern was seen in the aneurysm dome. The separation of fluid flow was also observed at the superior side of the border of the bleb. No impingement of inward flow onto the bleb was noted. There was a clockwise circulating flow pattern within the bleb, but it was larger in its area compared with the pregrowth model (Fig 2D). The vorticity mapping shows more complex patterns in the bleb of the postgrowth model than in the pregrowth model. The velocity of the major circulating flow pattern within the aneurysm dome was approximately 17% of the maximum flow velocity in the parent artery. Figure 3 demonstrates multiple sites where the value of wall shear stress was obtained. Figure 4 demonstrates actual measurement values of wall shear stress in the aneurysm models. 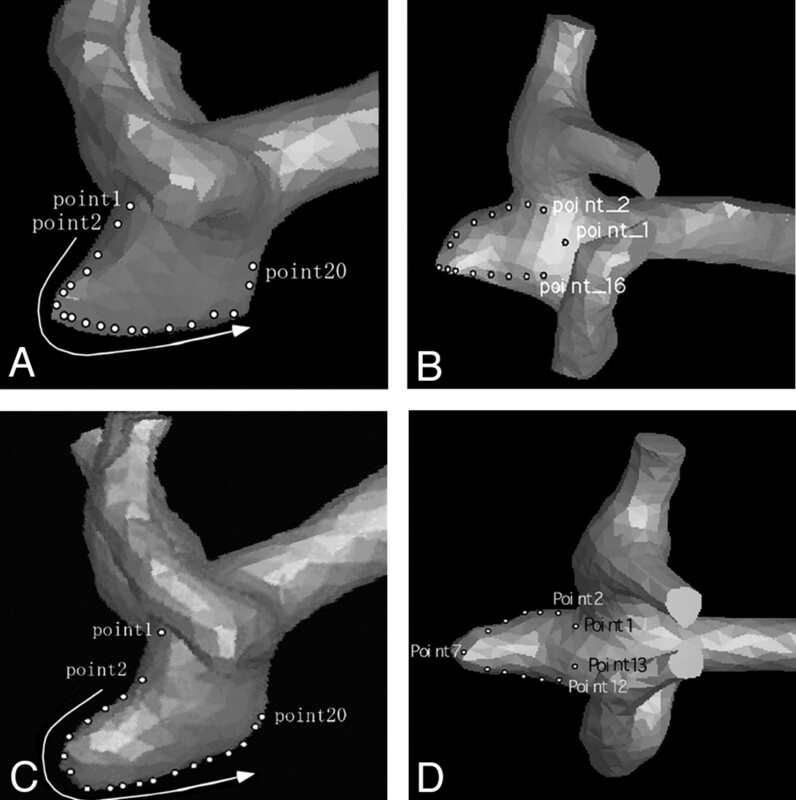 3D surface data of the MCA aneurysm before growth and anteroposterior projection (A) and superoinferior projection (B), demonstrating multiple points at which the value of wall shear stress was obtained. 3D surface data of the MCA aneurysm after growth, anteroposterior projection (C) and superoinferior projection (D), demonstrating multiple points at which the value of wall shear stress was obtained. A, Graph showing the values of wall shear stress (WSS) at 20 points along the aneurysm wall indicated in Fig 3A. Points 3–15 are located in the enlarging area. B, Graph showing the values of wall shear stress at 16 points along the aneurysm wall indicated in Fig 3B. Points 5–14 are located in the enlarging area. C, Graph showing the values of wall shear stress at 20 points along the aneurysm wall indicated in Fig 3C. Points 3–15 are located in the enlarging area. D, Graph showing the values of wall shear stress at 13 points along the aneurysm wall indicated in Fig 3C. Points 4–11 are located in the enlarging area. Min indicates minimal flow phase; acc, acceleration phase; max, maximal flow phase; dec, deceleration phase. 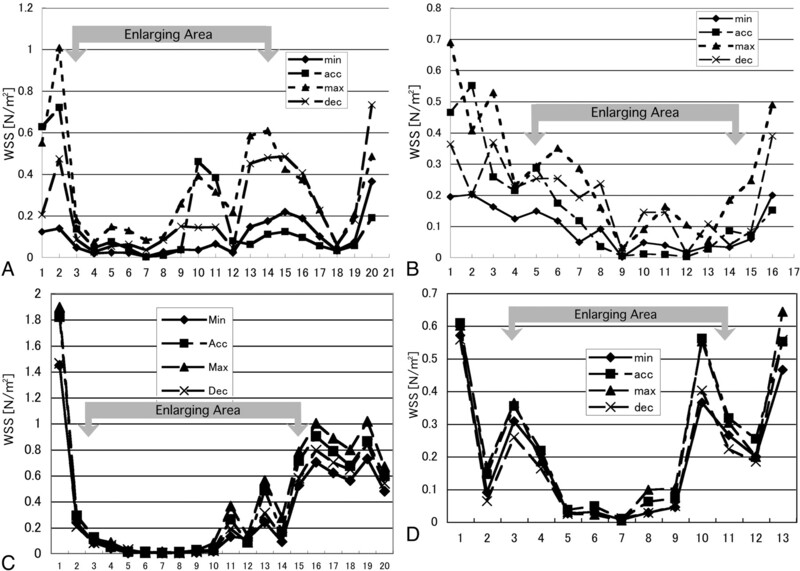 In Fig 3A (anteroposterior view of the pregrowth model) and Fig 3B (superoinferior view of the pregrowth model), points 3–15 and points 5–14 were located in the enlarging area, respectively. The wall shear stress was high in the neck of the aneurysm, and it was relatively high in the margin of the aneurysm bleb (Figs 4A, -B). The inferior margin of the bleb was exposed to comparatively higher shear stress where a strong impingement of downward flow was observed (Fig 4A, points 10–15). The value of wall shear stress decreased in the top of the bleb. The value of wall shear stress changed during a cardiac cycle at the points at which high shear stress was noted, but no negative values of wall shear stress were observed at any moment. In Fig 3C (anteroposterior view of the postgrowth model) and Fig 3D (superoinferior view of the postgrowth model), points 3–15 and points 4–11 were located in the bleb, respectively. The neck of the aneurysm was again exposed to higher wall shear stress. When compared with the pregrowth model, the value of wall shear stress was low in the bleb, particularly in its top region (Fig 4C, points 3–10). The margin of the bleb was, however, exposed to high wall shear stress. This finding became more noticeable than that in the pregrowth model. Blood vessels are exposed to many forces induced by pulsatile blood flow such as hydrostatic pressure, dynamic pressure, and fluid-induced wall shear stress. The hydrostatic pressure is nearly equivalent to the blood pressure. The dynamic pressure is a force produced when the circulating blood flow impinges on the arterial wall and is superimposed on the hydrostatic pressure. Thus, specific points of arteries such as branching points are exposed to higher pressure. In this study, there was no strong impinging flow onto the aneurysm bleb throughout its growth, suggesting that the bleb was not exposed to particularly high dynamic pressure compared with the nonenlarging area of the aneurysm. On the contrary, flow separation at the margins of the aneurysm bleb was observed throughout the growth. This result implies that the impinging force of blood flow may not be an essential cause of the growth of the small bleb in this particular aneurysm. We noticed that the neck of the aneurysm and the margins of the bleb were exposed to a higher wall shear stress. In contrast, the value of wall shear stress was low within the bleb throughout its growth. In vivo shear stress values can be estimated by multiplying the in vitro results by 9.22 on the basis of the similarity principle.8 The estimated in vivo maximum wall shear stress at the margins of the bleb in the pre- and postgrowth models would be 5.61 N/m2 and 7.83 N/m2, respectively. The flow separation noted at 1 margin of the bleb and the flow impingement onto the other side of the margin (Fig 2A, -C) might contribute to the high wall shear stress in the corresponding area. It has been postulated in animal studies that focal high wall shear stress rather than focal mechanical stress is a predisposing factor for cerebral aneurysm formation in healthy arteries.18,19 These studies also hypothesized that the initiation of aneurysm formation in the cerebral artery is due to destructive remodeling triggered by high wall shear stress. Morimoto et al20 reported that in mice experimentally induced by unilateral carotid artery ligation, the most remarkable degenerative changes were observed in the neck of cerebral aneurysms. Their results suggest that aneurysm degeneration occurs at the neck, as a consequence of focal high shear stress. Our results showing a high shear stress in the neck of the aneurysm as well as in the margin of the enlarging bleb might have contributed to the degeneration of the aneurysm wall. Some researchers support the hypothesis that slow-flow conditions and low shear stress contribute to the degeneration of cerebral aneurysms.21,22 The result of our present study demonstrated a slow-flow pattern and low shear stress in the deeper part of the bleb, particularly in the postgrowth model. It is impossible to conclude from our study that the high wall shear stress at the margin of the bleb or the low wall shear stress in the deeper part of the bleb contributed to the wall degeneration. Accumulation of knowledge from similar types of research may answer those questions. Although hemodynamic evaluation of a few clinical cases is not sufficient to reach a firm conclusion with statistical significance, the results obtained from a variety of in vitro or computational flow-simulation studies brought valuable information, which helps us to understand the natural history of a cerebral aneurysm and its therapeutic management.5,23–25 The results of the present study support a recent hypothesis that the process of aneurysm growth is not fully explained by simple fluid physics induced by impinging blood flow. Further flow biomechanical study and accumulation of cases are mandatory. A detailed in vitro evaluation of intra-aneurysmal hemodynamics in a growing aneurysm with a bleb was performed. There was no significant impingement of blood flow onto the enlarged region (bleb) of the aneurysm. Our study suggests that the mechanism of aneurysm growth is not fully explained by simple fluid physics and that the impinging mechanical force is not necessarily the cause of the growth of the bleb. Values of wall shear stress were high in the neck of the aneurysm as well as in the margins of the aneurysm bleb. These values decreased within the body and dome of the aneurysmal bleb. Further flow biomechanical evaluations in more growing aneurysms are necessary to corroborate or contradict our present results in this in vitro model of an enlarging MCA aneurysm. These hemodynamic evaluations should be implemented with concomitant biomolecular analysis of aneurysm walls. This study was supported by the Grants-in-Aid for Scientific Research (A) from the Ministry of Education, Culture, Sports, Science and Technology in Japan to Kazuo Tanishita. Paper previously presented in part at: Annual Meeting of the American Society of Neuroradiology, April 29–May 5, 2006; San Diego, Calif. Accepted after revision July 7, 2006.